For all intensive purposes Al Oppenheiser, Camaro Chief Engineer, is the guy you can blame for the run-away success of the fifth-gen Camaro. Though Oppenheiser has had his hand in a number of GM products–from the gen-one Colorado/Canyon to the Pontiac G8 and even the Geo Metro– his current position puts him front and center of all things Camaro. He’s not just in charge of engineering, he’s also has to make the business case for the finance, marketing, and manufacturing ends of the product. Hot Rod Magazine sat down with Oppenheiser at SEMA 2014 in order to find out more about the man behind the muscle car. Oppenheiser says growing up he always wanted to work on cars. During his first interview with GM the interviewee took him out in a ZR-1 mule with the LT5 engine– he was hooked. Though he didn’t land his dream job at first–working in the GM Performance Division– he was folded into the ranks. Years later, while in GM’s old Shreveport plant in Lousiana (where the company built compact trucks from 1981 to 2012), Mark Reuss called Oppenheiser about working in the GM Performance Division, “It was like a dream come true,” he told HRM. “We did,” he said. However, manufacturers have little time to actually close the track to the public and use it as a test track. Though the track is open to the public during the day, other traffic makes it difficult to post a fast lap time. “We’ve actually run Z/28 times that are significantly faster than the one we published in the video, but we respect the gentlemen’s agreement, and to protect our integrity, we don’t publish a time that we can’t verify with a video.” There ya’ go. Oppenshier owns a 1968 Camaro SS convertible, black with white bumblebee stripe, 350 small-block, a 1949 Chevy 350 small-block five-window pickup truck, and a 2014 Camaro Z/28. “I think that’s all I’ve had is Chevys,” he says. He and the team created a special 2004 Colorado mule, complete with the ZQ8 suspension package and a V8 (years before it was added to production). 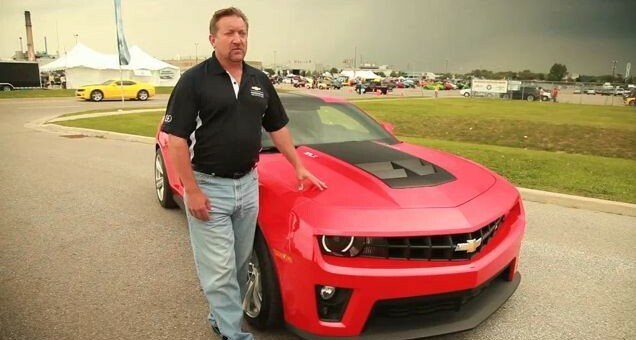 Expect Al Oppenheiser to be in attendance at Belle Isle two weekends from now, where the all-new 2016 Chevrolet Camaro will officially be revealed to the world, and he and his team can excite the world anew. Correction: For all intents and purposes. Sorry to be “that guy”, but I am. Lol, didn’t even see the comment before mine. Al is the guy for RWD performance at GM. He is one to be listen too as he is one of the best to leak info first. I couldn’t read past the first sentence.